Berni here with another creation for the Dies R Us Inspiration blog! The Dies R Us on-line store carries a huge assortment of amazing dies by several manufacturers. Fall is my favorite time of the year. This is my vision on what it looks like back home. I created a white mat to cover the card base. 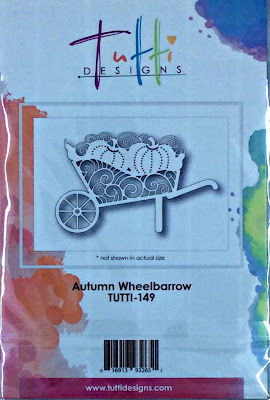 Used scrap pattern cardstock to create the color for the wheelbarrow. Added some watercolor to the pumpkins. Then added a dark brown border and placed an ivory color cardstock on top that is embossed for some texture. To create a little scene, added grass border and a leaf corner, added some flowers on the leaf and a sentiment and some bling on the wheel. Kindly take a stroll and check out all of the fabulous dies available at the Dies R Us Store; and do not forget to come join in the fun at the Dies R Us Challenge Blog! A new challenge is offered on the 1st and 15th of each month with a Gift Certificate to one winner each challenge. That winner could by You! Also, if you are new to Pinterest, kindly know you do not need to sign up or have a Pinterest account in order to enjoy all the lovely Pin-inspiration you will find. Such a darling card, Berni! Your fall coloring of the pretty Tutti die cut is beautifully done with fantastic dimension! I loved this card the second I laid eyes on it. That wheelbarrow is gorgeous with the bling on it, the corner flower and words are placed perfectly on the card, and the colors go so well together. Awesomely done! Beautiful Fall card! I love that Autumn Wheelbarrow die, so detailed and intricate! fun swirls in the wheelbarrow and love your leaves and flower corner treatment with it too! Oh Berni, I just love this!! 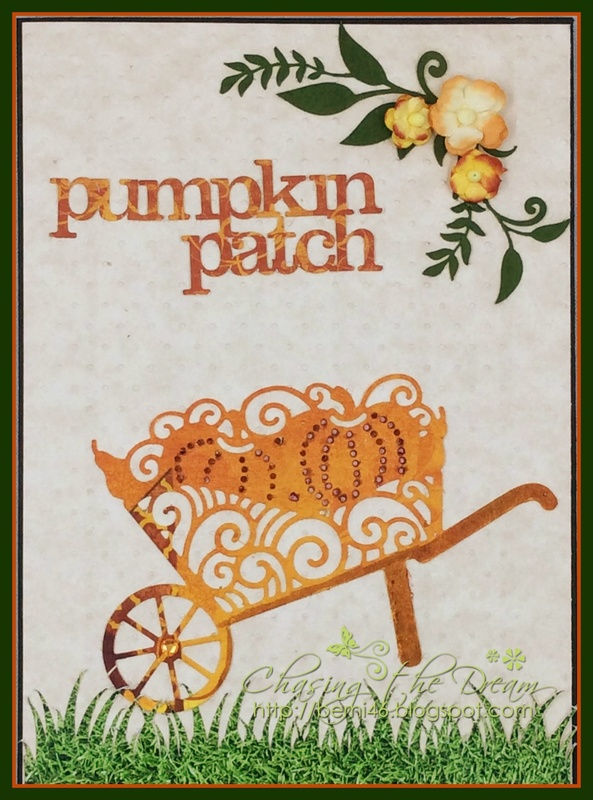 The corner cluster of flowers and leaves is so darling on this fabulous fall card! A Special "Boo" To You! Cute & Simple Christmas Tags!